"Gerona. 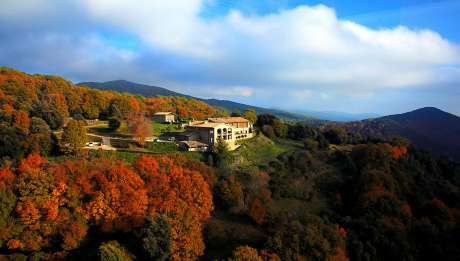 Calm and silence in the Garrotxa Natural Park "
If you want to make a family getaway this hotel is ideal. Located in the Garrotxa Natural Park offers a variety of activities for the whole family: family rooms, children games room, swimming pool, small golf course, etc. Routes and tours. Ventós is located within the Garrotxa Natural Park in the Volcanic Zone . You can practice hiking and mountain biking on the farm, because it has 5 tracks in the countryside. 3-hour four by four route in a safari like truck to visit the volcano area, Santa Pau medieval village, tour inside the country house and the Can Battle waterfall. New Bultaco motorbikes (hybrid between a motorbike and a bicycle, with autonomy for 100km). You may ride within the country house. Horseback Riding. If you like riding in this hotel you can, thanks to its large spaces in nature. Take advantage of the mushroom season to stay at Ventós, the hotel has arrangements with specialists who perform specific workshops (check with us) during the season (September to February). Customers which loves hunting there are specific days where you can enjoy the exclusive hunting of wild boar and corzo (small deer). Travel back in time and visit the medieval villages of Besalú, Castellfollit de la Roca, Santa Pau and La Val d'en Bas. Perfect for events and meetings. The hotel offers the ideal facilities in which to develop all kinds of events and meetings for business. The hotel has two meeting rooms with a maximum capacity of 20-30 people. Spend a little time outdoors in their gardens and terraces with magnificent views, or refresh yourself in the pool. Also if you want to practice your swing you can do it in their small pitch & putt next to the pool. Earth flavours.A creative and elaborated cuisine where local products are the protagonists, from starters to get to the desserts. Feel at home and relax in the main hall of the hotel facing the fireplace, or enjoy reading in the library. The route to El Ventos in Girona is much like the journey into Venice, which is lined with inconspicuous buildings and train tracks; only when you step out of the station does it become apparent that you have stepped through the looking glass and are in another world of canals, churches and gondolas. Likewise, the path to El Ventós is understated: it rises subtly between discrete oak filled woods and only on entering the hotel building does its lofty vantage point become apparent, providing views stretching out over the province to the sea. Vicente Fisas, the hotel owner and a great lover of books, felt it was important to create peaceful nooks in his hotel and it seems that he has even reached an understanding with the birds. "The silence can be heard here" says Vicente, and he means that literally: not even the wind, after which the hotel is named, disturbs the peace. The bedrooms have been simply decorated and contain elegant furniture and restored stone features. “Ademas de una estupenda localización, el personal estupendo, sobre todo el camarero, impecable su atención.